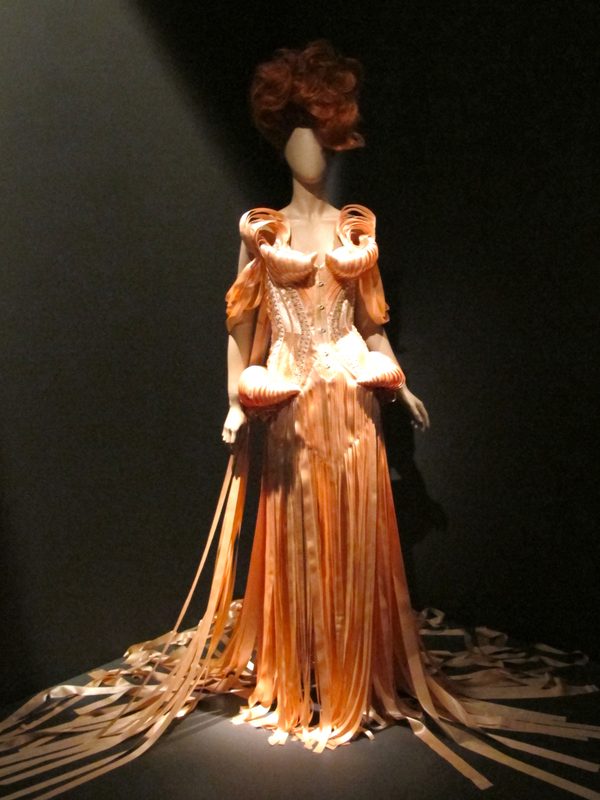 Jean Paul Gaultier at the de Young! 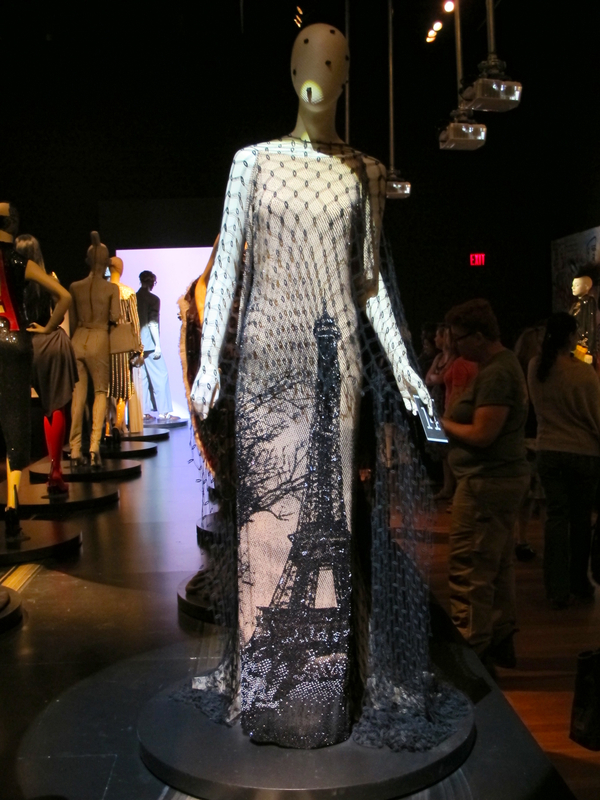 The de Young Museum in San Francisco is hosting The Fashion World of Jean Paul Gaultier: From the Sidewalk to the Catwalk through Aug. 19. (Full details at the end of the post.) If you live close enough, see it in person! If not, read on. I am fortunate enough to live about 90 minutes from San Francisco (very handy for attending Giants games and world-class museum exhibits). For those of you for whom such a journey is not possible, I am sharing my view of the show, along with a photos of a few of the most inspiring pieces from my seamstress perspective. Photography is not normally allowed at special exhibits at the de Young, but non-flash photography was indeed allowed at the Gaultier exhibit. Since the de Young website did not note any restrictions on where photos could be published, I called visitor services the day before to check whether I could post photos on my blog. I was told that I could. The woman I talked to there was quite lovely about it, in fact, and enthusiastically wished me an enjoyable visit. Don’t you love good customer service? The de Young could have shown these garments on a bunch of dime-store mannequins and called it a day, and the experience still would have been thrilling. However, the design of the exhibit was in itself a work of art and enhanced the experience tremendously. The lighting design, in particular, was ingenious. You’ll see what I mean with this set of three photos from the first full room of designs. The mannequin’s face is moving! This was accomplished with a subtly camouflaged projector that hung from the ceiling and was pointed at the mannequin’s head, which was devoid of features save for the nose and ears. There were 30 of these mannequins. Some were just blinking and looking around. (They reminded me of the birds in the Enchanted Tiki Room at Disneyland.) Some were singing. 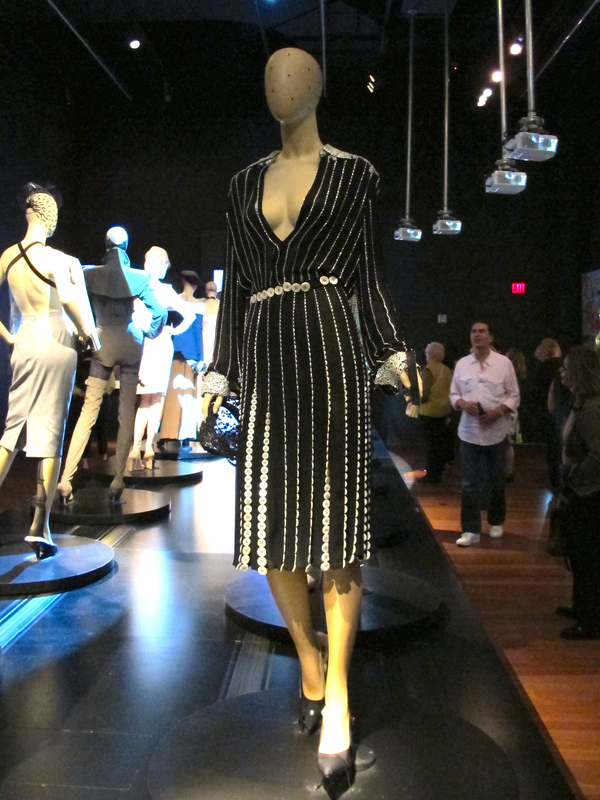 And Jean Paul Gaultier himself was speaking, welcoming everyone to the exhibit in his heavy French accent. He seemed quite charming. 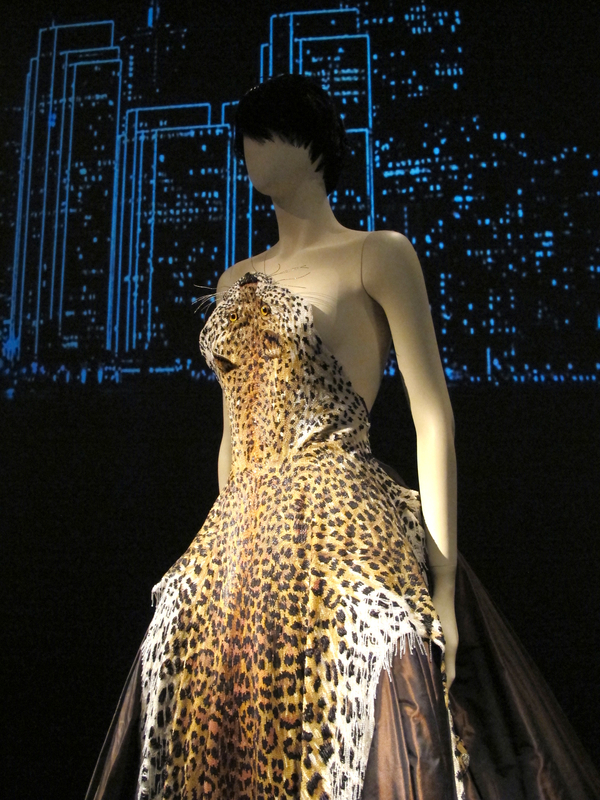 Look at this engaging Leopard dress. While leopard print is ubiquitous these days, there’s more here than meets the eye. See the detail photo below. 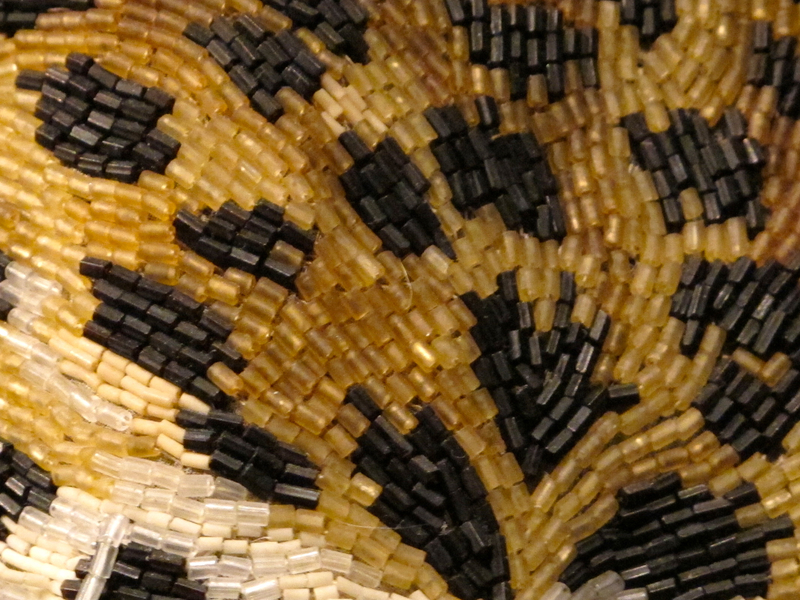 The entire pattern is executed in beads. Gorgeous, exquisite, time-consuming. The contrast design on this dress is entirely made of buttons. Look at the button detail. We all know buttons can make a great decorative statement, but clearly, I’m not using them to their full potential. I am IN LOVE with this Eiffel Tower dress. I think we’ve all seen placemats and maybe even pillows made entirely of ribbons, but have you considered an entire dress? Ribbon can be so much more than trim. Have you ever turned a fabric tube over a cotton cord? Can you imagine what kind of effort created this lace dress? These are stuffed fabric tubes. Can you see that the tubes vary in width? The placement must have been planned in advance and the tubes sewn and stuffed accordingly. 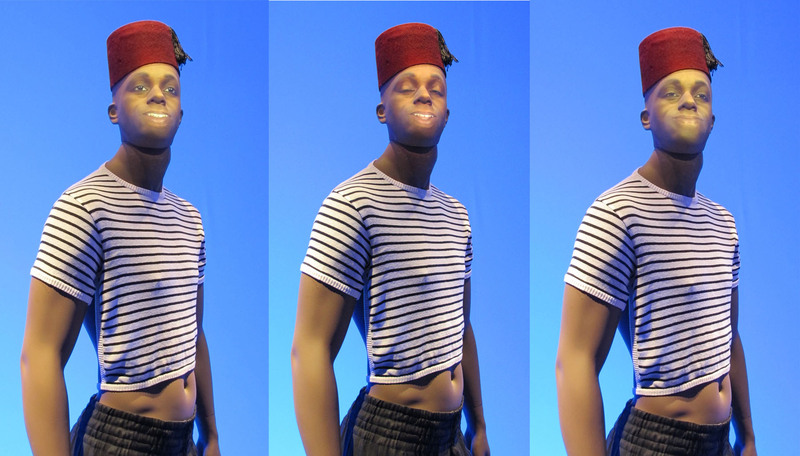 These are just the garments that I found particularly inspiring and a small fraction of what was on display. There is so much more to see, including trompe l’oeil pieces that make the wearer appear to be naked and costumes from Madonna’s Blond Ambition tour (cone bras and all). The vast majority of the garments are more statements and art pieces than something most people would have an occasion to wear, but they do serve as wonderful inspiration. In fact, since most of the pieces were not behind glass, I could lean in for a good look (but not touch!). It was reassuring and even comforting to catch a glimpse of good old machine stitches and familiar hooks and eyes. Many of the garment descriptions noted the number of hours required for construction. 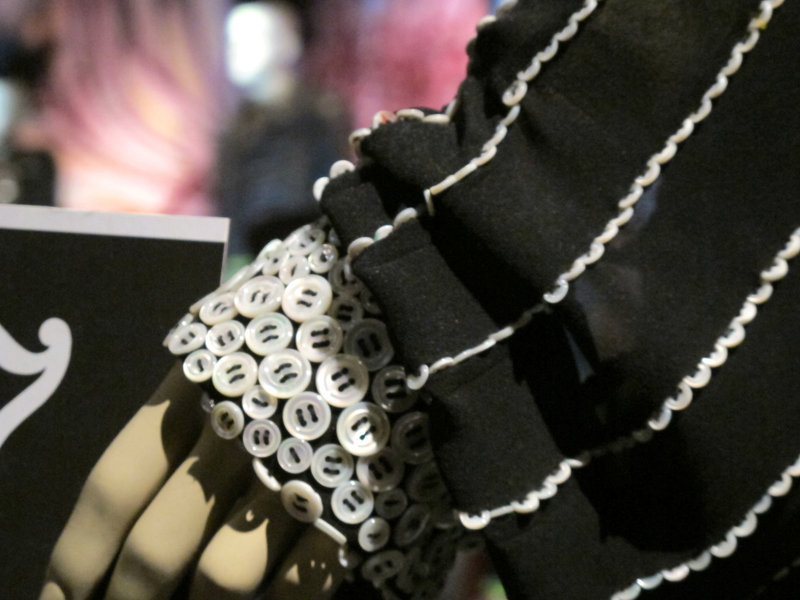 The exhibit was an entertaining reminder to push the boundaries of our sewing to unexpected places. But, alas, even my Fancy Damn Sewing Machine cannot construct a metal corset. I encourage anyone within a reasonable drive of San Francisco to view this amazing exhibit. Note for parents: The exhibit has adult themes. I would rate it PG-13. ← The “unwearable” muslin is saved! Thanks for the peek, fashion as art or art as fashion? All a matter of interpretation. I love the Eiffel dress, Marcy Tilton had a fabric recently with the same type of effect, I ordered it, but alas, I found out two days later that it had sold out. Still wondering about that one. Lucky Lucy, who was offering the Marcy Tilton fabric? Was it an online store? I need to find more good sources of fabric. That is one exhibition I would love to see. Unfortunately I’m on the other side of the world 😀 I remember that button-detail collection from Gaultier. All the pieces were gorgeous and that made me fall in love with buttons even more than I already was. And that leopard”print” dress is absolutely amazing! Such a talented beadwork on that. Rhia, I’m so glad I could share a little taste of the show with you. I realize how fortunate I am to live fairly close to San Francisco. Some wonderful exhibits do come through.